So things have been crazy as usual around here and we've decided to make some changes in hopes of getting some more quality time for our family and growing our business. For starters, I think I'm moving the office out of the house. It's been pretty tough running a business out of the house with an almost 3 yr-old and a 6 month old... I feel guilty when I'm working because I know they want me, and I feel guilty when I'm hanging with them because I have work waiting for me right there. Hopefully, getting the office out of the house will give me strict work hours and put a little bit of a chill on my workaholic tendencies. My goal is to keep work at the office and then when I'm home, I can really just relax and be home. I found myself wanting to go on vacations and get out of the house to relax and I realized that I now associate home with work. (Not that I don't love work... but I need my family time.) I want home to be just home. I'm so excited about it and am 99.9% sure it's a 'go.' As you can guess, I'm already psyched to do my new office. The new office space is about to undergo a major renovation and the fun Victorian wing chair I found is the only piece I have squared away for sure (being reupholstered in a special fabric.) My office will be pretty small so I'll need to pack in a lot of function in a small space. I think I will have room for a massive inspiration wall. I've been reading Thomas O'Brien's American Modern and cannot wait to try out some of his ideas on it. I hope you're enjoying this summer, and I am sorry I am so MIA- Dave's home for the summer and I'm trying to spend as much of my free time with him & the boys as possible. I truly love your comments and reading my favorite blogs- many of which I have yet to add to the new blogroll! !- but just have not been able to comment the way I wish I could right now. Great Idea Lauren. I feel your pain as I have my office in my home now. When the kids were your age it was REALLY hard. Now that they are 11 and 13 it is so much easier because they can do so much for themselves now and involve me when they need to. The guilt is not so intense! Hang in there while the kids are young, it's hard but it will get easier! I admire you for putting your family first. You will never have regrets, I promise!!! We wish you all the best with your move of your office out of the house. Hope it will help you focus. Can not wait to see the new office. I totally can relate -- I practice law from home and it's a really tough balance that I struggle with daily! I can't wait to see the new digs -- I know its going to be fabulous! Great decision. I'm sure you will garner huge amounts of creativity and quality in separating the two. Good move Mamasita! You know you have hit it big when you can move out and start anew. I still work from home amid four children, it can be a struggle especially phone conversations. Lauren, Congrats on taking the next big step! I work from home too and I know how challenging it can be even without kids (but a husband at home that I can't bear to neglect!) You are one of the hardest working women around. You deserve to have separate space for work and home. I can't wait to see the new office and finally get to hear your exciting news! Lauren, congrats! This is a huge step but I am sure it will benefit both your family and your business. I've got to say I work way too much with my office in the house...and so much is done late at night....b/c even with a nanny in the house so I can work, I find the pull difficult. I cannot wait to hear more about your new digs. It sounds fabulous!! Congrats and can't wait to hear more details! Small or not I know it will be fabulous. I recently had plans to "move out" of the home, but with the current economic environment too many obstacles got in the way. For me, it has turned out to be a blessing as so many other opportunities arose in it's place. Isn't it funny how things can work out? All the best for your awesome venture!! I can understand your frustration. While working from home is a huge blessing it does have its limits. Good luck with the switcharoo. So exciting, congrats on the big move!! My husband and I also work from home and it's true - it's easy to start to associate home with work. Can't wait to hear more about the new office space! Congrats on your new office. Can't wait to hear the rest of your news. Sounds like you have some great opportunities with your new office and spending time at home. Best wishes!! Lauren that is so exciting! Congratulations - how wonderful. and, of course, i can't wait to hear the rest of the juicy details! Good luck with your new office..how exciting! When my twins were 5, I shifted from full time worker bee to at home Queen bee, and then slowly added work, a site and do work from home. The blessing is to find balance but know that nothing is ever perfect so it is good to take the time now when they are little and set good routines and habits into place. Good luck with finding the right balance and I can tell that you love both! It is ok to feel guilty trying to juggle. Help is also key. Ask for help! Awesome news....I know your new space will be beautiful! 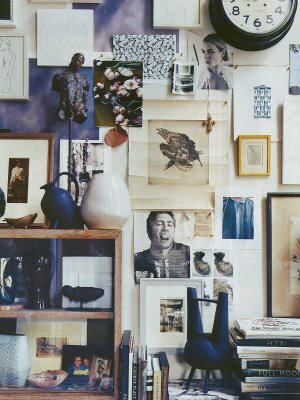 Remember Drew Barrymore's inspiration wall featured in Domino? That is one of my all-time faves. You're moving out..but moving up! Very exciting! And, yes, isn't the SK office to die for!!! It's hard finding the right balance between work & home when you work at home. Good for you for recognizing they need to be separated! Can't wait to hear the rest of the big news! I can't wait to see what you do with the new office! That sounds like a great idea! Can't wait to hear more about it and see your new space. You are making the right move,Lauren. Can't wait to see the new office space! I can't wait to hear what is in store for you! I love following your career, it's such an inspiration for mine. Congrats on the new office! Best of luck in trying to find that balance. It is so hard to set the boundaries needed to do work from home. A different space, away from home, will help you define where your focus should be at different times. I have big girls at home and I can't even justify my blog time sometimes when I know my time with them is so fleeting! Lauren, I am with you about how complicated it is to work from home...but at the same time, I wouldn't change it for anything! I can run to the office and work in my pj's sipping my cup of green tea and nobody knows that I am not all dressed up. It takes balancing acts and time management skills, but if I stay focused, I find I can do it! Hope your new adventure works out better for you. How fun to have a new space to work from. I agree, working from home makes the temptation to never rest too great for us Type A peeps. This is so exciting! I'm so happy for you and can't wait to hear all about the new space....and it sounds like perfect timing too. Looking fwd to the chair reveal as well! Yay, how exciting!!! I bet it'll be absolutely gorgeous!! That's a big step and so exciting. I can NOT wait to hear what you've got up your sleeve! Happy weekend, Lauren! And oh yes, S. Kasler's office is ridiculous. Best. Office. Ever! Very exciting! Good for you. So exciting. I have done both and they have their pluses and minuses. I think that you will love an office away, especially with little ones so little. Can't wait to hear more! we understand! You should concentrate on being a good mama! And it will be great to have an office where you can really focus! Cant wait to see what you do with the new office! It's going to be FAB! You are a HUGE TEASE!! I am dying to know whats going on with the new office now! I hope you spill the beans soon!! You will never regret moving the office out....I did it with my previous business and never looked back....smiles. How fun, Lauren, for us to see yet another space of yours! Can't wait! Will look forward to seeing images of your new space. I am sure it will be beautiful. We are off to Europe in a few days, I will keep a travel log on my site, so come if you like and see where we are! Lauren, I am just thrilled for this next step in your career and I hope it happens and know you will make it so beautiful! I do think you deserve to have a separate work realm to give both parts of your life 100% attention. Enjoy the summer and concentrate on YOU and the boys and don't worry about us...we will be here when you are. congrats lauren! that's very exciting. as a new at home business owner, I will be excited to see how the new space works out for you! Congrats on the new office space - and love the pic of Suzanne Kasler's office! Can't wait to see what yours will look like! You are doing the right thing! The constant struggle of balance. Heart vs work - sometimes the line gets blurred. I too love my work and adore my family and whilst my studio is here at our house, I sometimes curse the constant feeling of guilt for not being enough. Cloning would be great some days! Sounds like you are making the right moves and changes. Best of luck with everything. Lauren, that's just fantastic!! With four year-old twins, I totally understand the push-pull when you work out of your home. It's tough! So I'm thrilled for yo and I can't wait to hear the rest of the news!! Just found your beautiful blog. New office???? You will LOVE it. I moved out of my home office and hired a full time assistant this past year and despite all the nay sayers (Everyone! - "the economy, you know"), I've increased revenue every month and have steady projects flowing in to cover all the monthly bills. It's scary, but well worth it. Clients, reps, even my other friends that are designers love coming in to visit. Good luck! Go for it!